There is nothing more satisfying than trying out a new restaurant and knowing well in advance that the experience will be wonderful. This was the feeling that I felt when my food accomplice and a fellow food-connoisseur friend went to a Chicago-based Ethiopian restaurant called Ethiopian Diamond at 6120 N. Broadway in Chicago’s Edgewater. 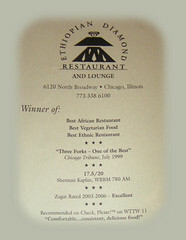 We each had gone to several other Ethiopian restaurants in Chicago, but Ethiopian Diamond immediately came recommended from the connoisseur and she had yet to disappoint us with a recommendation. With our individual schedules being ridiculous, we were quite eager and could hardly wait for our adventure. The night came, we met at the restaurant, did what comes natural at a fine eatery, and left fully sated. Ethiopian Diamond was exactly what we needed. 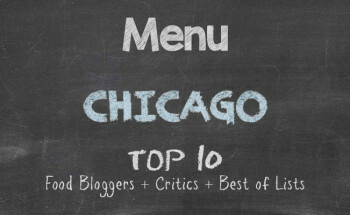 The ambience, the service, and the food, of course, all warrant an excellent review. 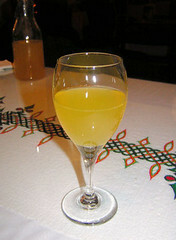 As is customary in all Ethiopian restaurants, for us, we started out with a bottle of tej, Ethiopian honey wine. This wine is indeed as sweet as honey and goes down incredibly smooth. It was a great way to unwind from what was a hectic and scrambling day for the three of us — to think that I went home afterwards and studied for a few hours; I love graduate school. For those of you who must absolutely dine with silverware, this restaurant is not for you. Footnote: no Ethiopian restaurant is for you. 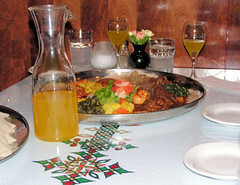 The meal came on a huge platter of ingera, a sponge like bread that is common in the Ethiopian staple. You have to use additional ingera to pick up food with your fingers to eat. [I have found that eating in a cultural manner brings about more of a feeling of family than the individual plate antics prevalent in American and Americanized restaurants.] The only time silverware became available was when we were having dessert. Even then, we used our fingers. We are not prudes about food, so we ordered a selection of several entrée items: chicken, beef, lamb, and mostly vegetarian. One would think that with us ordering so many items, we would have picked something unknowingly that would have resulted in a wince. No, it was impossible to make a bad choice from the menu since everything was so delicious. I am sure your stomach is growling at this very moment, so I shall anger you by listing the items that brought great smiles to our faces. During the meal, one of the patrons in the restaurant pulled out her cell phone and took some photos of the platter at her table. Listening in on the conversation, she was then emailing the photos to some co-workers who were averse to trying out new delicacies. Although the individuals on the receiving end of the email note were probably anti-ethnic cuisine, which is a crime to me, you cannot tell me they did not ache or hanker a little for what was on the platter. I ache even now for some more, but that is just withdrawal. Good food is my drug and I will go back for my fix. Smile. After feasting on such a colossal meal, you are probably saying, “They could not have had anything else except for the check.” No, we sat long enough to let some of the food go down before we indulged in dessert. 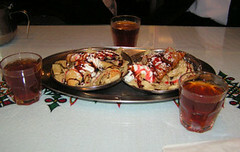 For dessert, we had Ethiopian spiced tea and two pastries that could make me sing like one of the great opera tenors. The sambrosa selit is a pastry that has spiced tropical seedless dates baked in it. The other dessert, destaye, is a thin dough shell stuffed with dried red and white raisins, pistachios, split almonds, shredded coconut, and cardamom powder. And I did not blow up like a chipmunk from snacking on the nuts. Oh, yes, I have piggy potential. Ethiopian Diamond is neither expensive nor corner-store cheap. That is beside the point. I give Ethiopian Diamond five stars. For the huge platter of food, bottle of honey wine, tea, and desserts, the price was surprisingly reasonable. Because the dining experience is truly an Ethiopian experience, I recommend going with family for your first visit. [It is a great way to bring family together, especially since the kiddies eat junk food mostly in their rooms in front of the television and the parents eat in route home from work.] Then after you have had your family experience, go again with one or more friends. You will be glad that you did. I know I was glad that I went and I will go again. Cheers. Ethiopian Diamond is excellent, but you gotta try Ras Dashen – it’s just down the street, about three blocks south of there on Broadway and Ardmore. EXCELLENT food. Consider it on the list. We’ve done Addis Abeba, Ethio Cafe, Mama Desta’s, and Ethiopian Diamond, but had not done Ras Dashen. Many thanks for the recommendation.